Fisker Automotive, the builder of the famous Karma plug-in hybrid sports sedan, is still a young company. It needs all the help it can get from experienced workers and managers. It will get plenty of it from its latest recruit, Tom LaSorda. 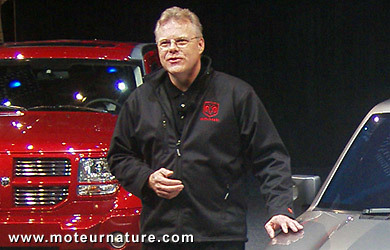 Our pictures shows him in 2006, when relaunching Dodge in Europe. He was one of the architect of the Fiat takeover of the Chrysler where he was number two. He even was Chrysler’s CEO for a short period, not forgetting that he previously worked 23 years for GM. A man like him will be immensely helpful for Fisker. Tom LaSorda will be vice chairman of the board, but he’s expected to be much more than that, and quickly have its hands full with all the company’s problems. They couldn’t find a more experienced person to face them.